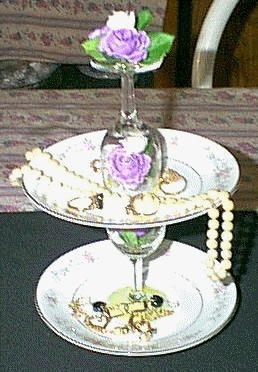 Recycle some saucers and small liquor glasses and make a pretty tiered holder for bangles, rings or earrings. This project makes a practical gift for Mom – a recycled jewelry holder to organize her necklaces, rings and other little trinkets or pieces of jewelry. It’s a project that would also work well as a small centerpiece for wedding tables – just add more floral decorations, and use to hold small tulle sachets or wedding favors. 2 liquor glasses – I got these at a yard sale; I thought they were so pretty. Glue some silk flowers in the first glass facing upwards, then glue the stem of the glass to the center of a saucer. Now glue the next saucer on top of the glass that you just glued down, making sure that you center the saucer exactly. Glue silk flowers upside down in the glass so that they are facing up the stem. Glue this glass to the saucer upside down so that the stem is now a handle. Glue some silk flowers on the top of the glass stem as shown in the photo. Enjoy!